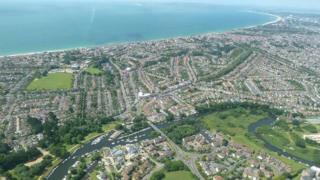 Bournemouth and Poole residents will pay more for their council tax when the two authorities merge with neighbouring Christchurch, it has been confirmed. Members of the BCP shadow authority met on Thursday to agree the first budget, including its share of the charge. The bill for Christchurch residents will go down slightly but will remain the highest of the three boroughs. The creation of new town councils for Christchurch and Highcliffe will incur an additional charge. The borough councils of Bournemouth, Christchurch and Poole are set to merge into a single unitary authority in April as part of a reorganisation of local government in Dorset. At Thursday's meeting, a 2.99% increase was agreed for Poole, bringing a band D property to £1,441.53, and a 2.4% increase agreed for Bournemouth, which would bring band D bills up to £1,473.40 a year. There will be little change for Christchurch where bills will be cut by £8.86 a year, meaning a band D property will cost £1,598.30. The figures do not include precepts for police, fire and town or parish councils. A spokeswoman said: "The bills across the three councils are different at present as the councils are starting at different levels. "The recommended budget sets out that council tax will be the same for all residents of BCP in 2025/26. "In order to achieve this, Bournemouth and Borough of Poole rates will rise over the next three years. Council tax harmonisation will be achieved within seven years." Shadow authority leader Janet Walton said: "No resident is seeing a council tax rise greater than would have been likely under existing arrangements and residents in Christchurch are seeing a slight reduction in their council tax." "The Shadow Authority has worked hard to strike a balance between no resident seeing a Council tax increase greater than the government's referendum threshold and minimising the difference in council tax levels between residents of the respective preceding councils. No resident is seeing a council tax rise greater than would have been likely under existing arrangements, and residents in Christchurch are seeing a slight reduction in their Council Tax. Our plan is that all households within each council tax band will pay the same levels within a 7-year time frame." BCP's overall budget for 2019/20 totals £735m. Dorset Council, which will cover the rest of the county, announced its budget and council tax charges earlier this week. Bills have been harmonised, meaning Band D properties across the five districts will all pay £1,629.75.